Annual Physiotherapy Webinar Club Membership. Access to the next 12 monthly webinars and all archived webinars. Flexible, convenient CPD. You can watch your webinars whenever you like on your desktop, iPad, tablet or mobile. 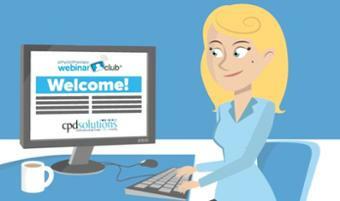 Simplify your life with Webinar Club! How can Webinars help me complete my CPD? You can watch your recorded webinars at any time. Perhaps a client cancels an appointment at the last minute, or you have a break during a session. Use the time to complete your CPD online and get current clinical information from leading experts. Webinars allow you to control your time and save you money as you have no loss of earnings, travel or accommodation fees required to attend courses. You can record what you watch and when with your CPD Tracker. Make some reflective notes to refer back to. View archives – See what’s already there for you immediately when you join. Must I attend the live event? No. All our webinars are recorded, so if you miss a live event you can login to your membership area and watch the recordings whenever you want to. Recordings will be available in your membership area 1-2 days after the live webinars have taken place. Are there discounted rates for several members from one clinic? Does Physiotherapy Webinar Club carry a Guarantee? Physiotherapy Webinar Club is brought to you by CPD Solutions Ltd, leaders in the provision of CPD for professionals since 1998. All CPD Solutions memberships and courses carry a full Money Back Guarantee.